In the first part of our blog on “Natural McKinney,” we covered the Heard Natural Science Museum & Wildlife Sanctuary (which happens to turn 45 years old this weekend!). Now in this second part of our series on what makes McKinney unique, we’ll highlight other McKinney locations, in addition to the Heard, where you can relax and experience nature. This beautiful 212-acre city park sits north of University/380 and east of N. Lake Forest (4300 County Road 1006) and features more than eight miles of challenging mountain bike trails. The Dallas Off-Road Bicycle Association (DORBA) maintains the trails which are twisty and full of dips and tree roots. Read reviews of the trails HERE. Indian paintbrushes blanket the open spaces at Erwin Park. Note: A McKinney CVB staff member tried walking the trails with a friend awhile back and let me say that we wished we were on bikes. We certainly did get our hearts going – great cardio workout – and our legs were quite achy (that’s a good thing!) from climbing in and out of the big dips. If you try this, we suggest you wear hiking boots instead of running shoes, and be prepared to yield to the cyclists as these really are their trails. Erwin Park offers a nice mix of wooded areas and open space where you can feel far away from the city when in actuality, “civilization” is a mere who miles south. Here you’ll find three picnic pavilions (you’ll need to reserve these by calling 972-547-2690), restrooms, playgrounds, and a fishing area. Probably the best part of Erwin Park – certainly for outdoor enthusiasts – is the fact that overnight camping is available here. Like the picnic pavilions, you’ll need to make reservations at the number provided. Keep cars on the paved areas please, and take a camera along as you’ll want to capture the action and the scenery. 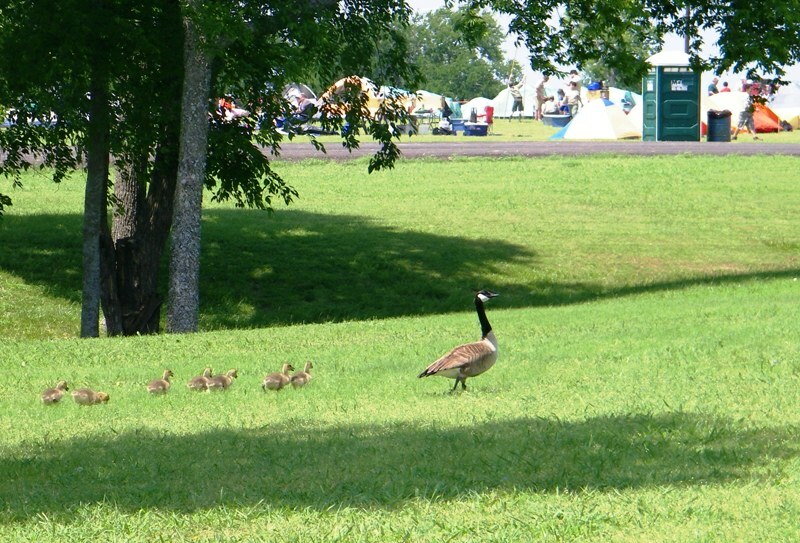 A mama goose and her babies take a stroll near Boy Scouts camping at Myers Park. Right up the road from Erwin Park, you’ll find the rolling hills and large clusters of trees as well as a lake and gardens at the almost 160 acres of Myers Park & Event Center. 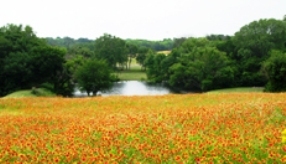 Owned by the county (Collin County), it is a real gem with all sorts of activities going on year-round. The non-nature- related part of Myers Park features a show arena and stalls where FFA livestock shows, horse shows, rodeos and other events go on, including dog agility shows that fill most weekends from fall into late spring/early summer. Next to the arena is the park’s event venue with complete catering kitchen, restrooms, and large seating area, making it perfect for receptions, family reunions, and other parties, and just down the hill from this facility is a lakeside gazebo, a popular wedding spot. Cross the lake via the bridge and… hello, nature! 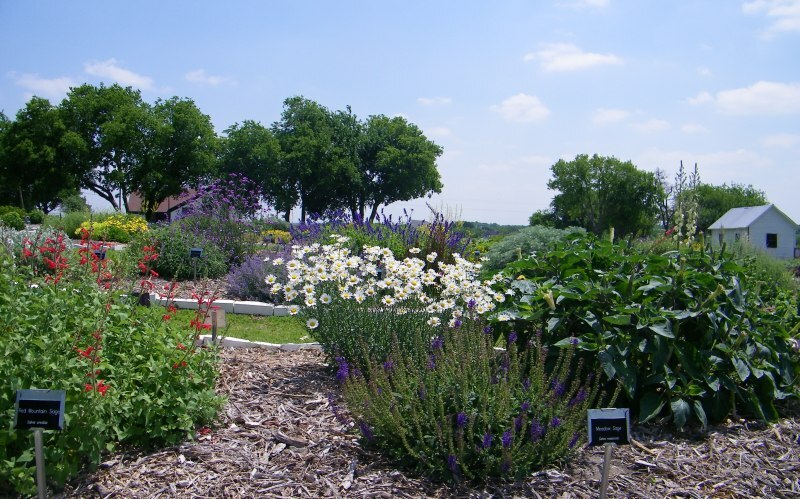 Research Gardens at Myers Park teach about drought-resistant plants. Supervised youth group camping is allowed in Myers Woods (scouts, churches and such) where you’ll find fire pits and great spots for pitching tents. No cars or motorcycles are allowed in this rustic area so all supplies will need to be carried across the footbridge. Up the hill from the wooded area the perennial garden and a clearing area called the “Back 40.” This is a hilly, wide-open space perfect for large group events. Note: A few years back, a re-enactment group held a weekend long event complete with cannons, horses and plenty of marching troops. And back on the other side of the woods from the Back 40 are a pole barn and stage for use by groups for parties and meetings, as well as the Collin County Farm Museum, park office and the research gardens that were created and are cared for by the Texas AgriLife Extension Service and the Collin County Master Gardeners. Keep in mind that all activity at Myers Park needs to be scheduled through the park office or the Collin County Farm Museum by calling 972-548-4792 or emailing mpec@collincountytx.gov. May we suggest a visit to the farm museum followed by a family picnic near the lake or in Myers Woods? Or plan a group camping trip. Just make sure to carry anything out that you brought in, please. 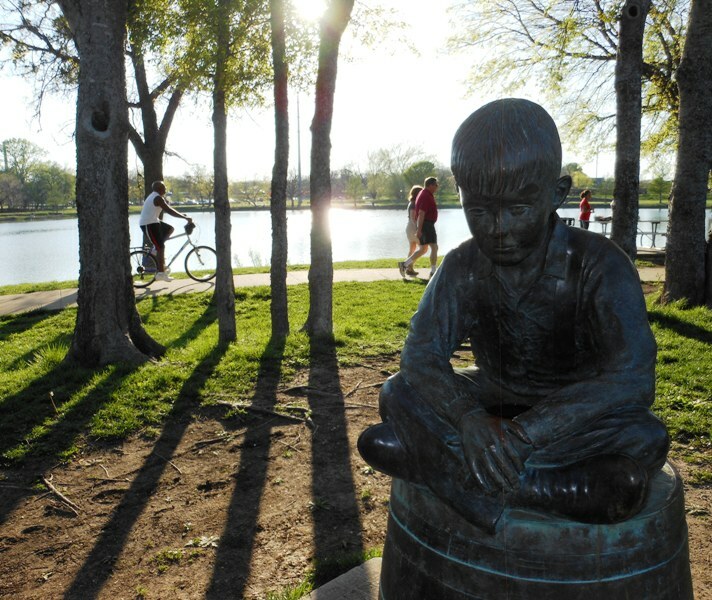 The bronze sculpture “Memories” sits on the northwest side of Towne Lake Park. 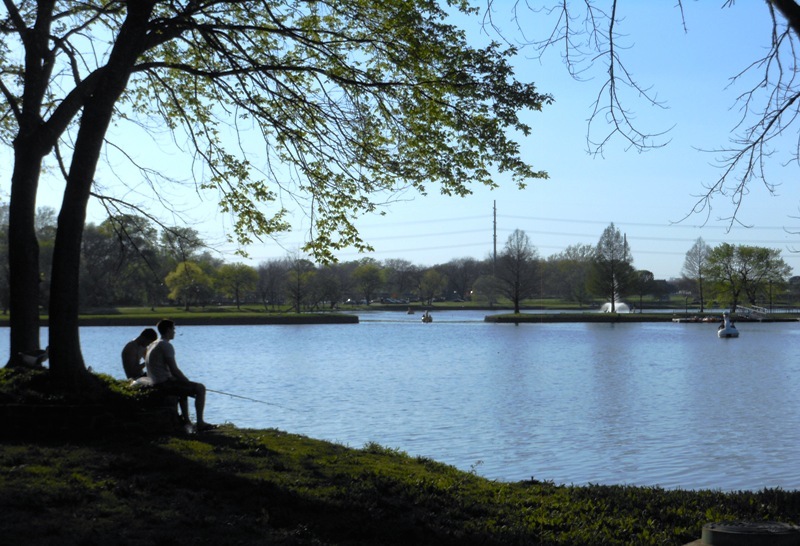 This centrally-located community park features at its center a 22-acre lake with paddle boat rentals, a fishing pier, and fountains. Two picnic pavilions and picnic tables and benches scattered throughout the park make it a perfect spot to enjoy nature while relaxing with family and friends over a meal. A concession stand, playground, lighted horseshoe courts, sand volleyball courts and the challenging disc golf course and softball/baseball complex on the east side of the park prove Towne Lake offers a little something for everyone. Also here are the community center and nature trails with meditation garden located to the south of the park. The city holds the annual summer concert series, Jammin’ in July, here as well. And when you do come, make sure to bring bread to feed the many ducks and geese who call Towne Lake home. To reserve the picnic pavilions at Towne Lake, call 972-547-2690. For information about the paddle boat rentals, call 972-542-4865. Watch for more ways McKinney is “Unique by Nature” in future blog entries from the McKinney CVB. Or check out all the city parks and trails on the city’s website or find parks listings on the Visit McKinney Texas smartphone app.